The Pakistan Domestic Biogas Programme (PDBP) aims to facilitate the construction of domestic biogas plants at the household level. It is being implemented by a non-profit organisation, Rural Support Programmes Network, with technical support from the Netherlands Development Organisation (SNV) and Winrock International. The introduction of biogas will help address Pakistan’s energy shortages, especially in the rural areas, and the government will benefit from reduced demand for subsidised fossil fuels. 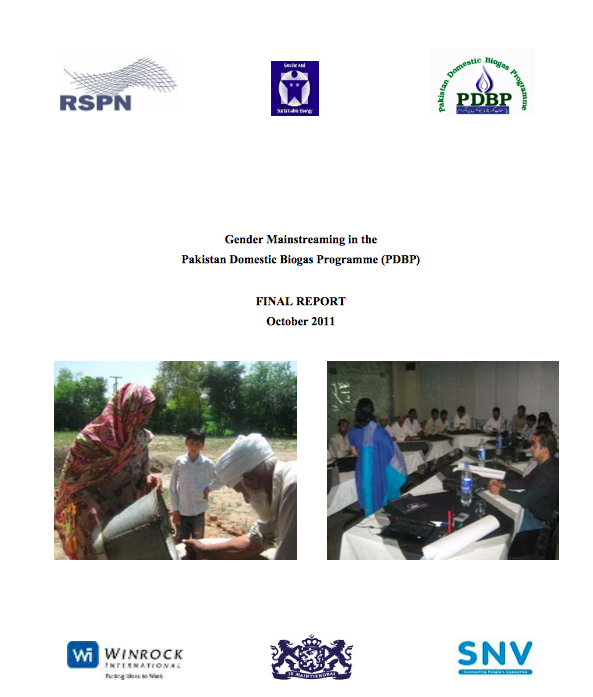 Between 2009 and 2011, the PDBP undertook a gender mainstreaming process, with support from ENERGIA, the International Network on Gender and Sustainable Energy. Gender mainstreaming is important in the PDBP because the main beneficiaries of this project are expected to be women. The overall aim was to integrate awareness of and attention to gender-specific concerns into every aspect and level of the PDBP in the present project and in succeeding projects.